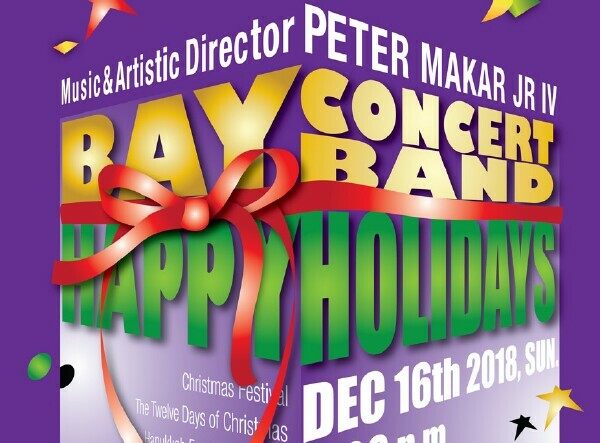 Always in the Holiday Spirit, The Bay Concert Band has wrapped it all up for you! To really get you into that holiday mood, the 50+ members of the band will be performing their annual Holiday Program this Sunday at 3:00 p.m. in the Bay City Central High School auditorium. AND WHAT A DEAL! Admission to this live concert is only $5. Children in the 6th grade and below are admitted free. Following their traditional concert opener, John Philip Sousa's arrangement of "The Star-Spangled Banner", the band will embrace that Holiday spirit by performing Leroy Anderson's exciting holiday medley, "A Christmas Festival". Additional selections you'll enjoy this Sunday afternoon are "The Twelve Days of Christmas," "Hanukkah Festival Overture" and "Twas' the Night Before..."
After a brief intermission, the band will perform "A Fireside Christmas arranged by Sammy Nestico. Next, a Dixieland combo, backed by the entire band, will perform "A Holly Jolly Christmas", followed by Tchaikovsky's "Farewell to the Kingdom of Confections". The concert will close with the inspiring "Hallelujah Chorus" by Handel. Once again, Bay City is treated to a concert that you just don't want to miss this one! So get festive Sunday, bring the kids, and come out for some of the best LIVE MUSIC of the year! Doors open at the Bay City Central Auditorium at 2:30 pm. Admission is $5 with students 6th grade and under free.